That crozier is the biggest thing I have ever seen. Ever. Look at it -- it's almost bigger than Bishop Calvo. Throw in the floral necklace and it's a scene reminiscent of Honolulu in July. You remember that now, don't you??? And what's not to love about that? 10-year-old Anthony Woodward beamed with pride as Calvo, the new Bishop of the Roman Catholic Diocese of Reno, greeted parishioners in the Reno Hilton Pavilion. Woodward, of Reno, played a conch shell while several bishops laid their hands on Calvo's head, part of the two-hour ceremony that made Calvo the official head of the Catholic Church in Reno. "It was like an honor just to do that -- a once in a lifetime chance," Woodward said. He practiced playing the shell for six months before the ceremony. 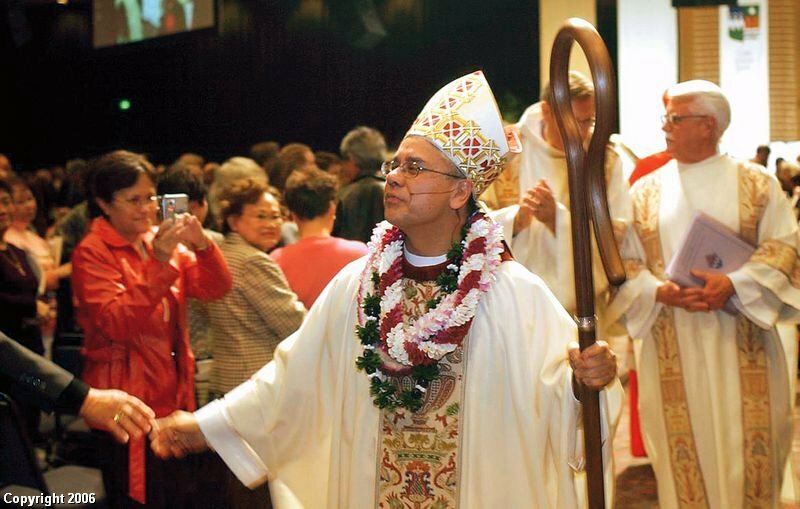 Inculturation points there.... And what's the new bishop's approach? In the tradition set forth by Jesus Christ, church leaders must go to where the people are, Calvo said earlier on the day. "That is going to where they are," Calvo said. "The challenge for us with young people is where they are, and how do we communicate with them." "(Calvo) has a way about him. You can see he's just going to be one of the best bishops." Appointing beloved bishops who make good impressions... there goes that Benedict again.